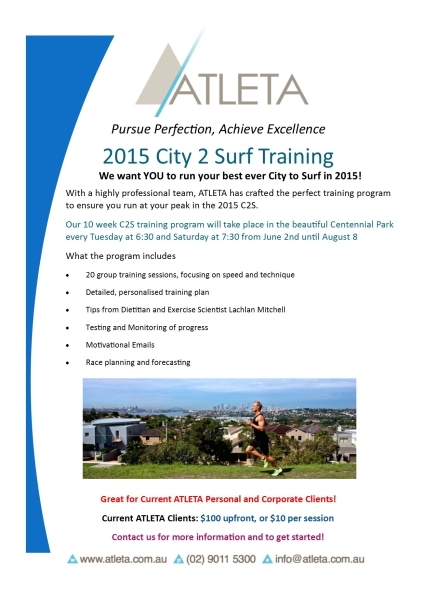 Looking to run your best ever City 2 Surf? Or even just looking to make the distance, and smash your first race? ATLETA’s scientifically designed training program utilises the latest evidence based training protocols and the most recent health research, to ensure you receive the highest quality training, while working towards your C2S goals. Just what does our C2S training program involve? Read below to find out more about the program, the trainers and how you can make 2015 your best City 2 Surf yet. Our bi-weekly training sessions will be run by Exercise Scientist Johann Ruys and new ATLETA high performance intern Kate Murphy. Both studied at UTS in Sport and Exercise Science, and already boast an impressive array of experience in the field. Both trainers are familiar with the most recent developments in sport and exercise science, and ensure this level of knowledge is delivered to all participants in this program. ATLETA’s resident Dietician Lachlan Mitchell has included useful nutritional advice for all participants in the training. Having completed his Honours in Nutrition and Dietetics, Lachlan is currently studying his PhD in a similar area, so you can be sure his nutritional advice is of the highest quality and will ensure your peak performance. ATLETA’s VIP Trainers Neil Russell and Rob Lyon, both highly knowledgeable and with a combined experience of over 20 years, have developed the program in accordance with the level of quality a high performance athlete would require in their own training. How can you make this your best ever C2S? Come along and join us for our bi-weekly sessions! Not only will you receive the highest quality training, you will also meet other like-minded runners and have a great time. There may even be some special guest appearances, and the occasional competition week. Make sure you follow your program. Coming to our sessions is a great way to improve your performance, but to run your best ever C2S you’ll need to stick to our expertly crafted program and push yourself to the limits. Get in contact with us to find out more, and to book your spot in the C2S 2015 Group – Get in early as the early-bird special only runs until May 22, and spots are filling up fast!